Unfortunately, though, she did it in the context of challenging the work of Anders Ericsson, who has done the groundbreaking research on the concept of deliberate practice (see The Best Resources For Learning About The 10,000 Hour Rule & Deliberate Practice). 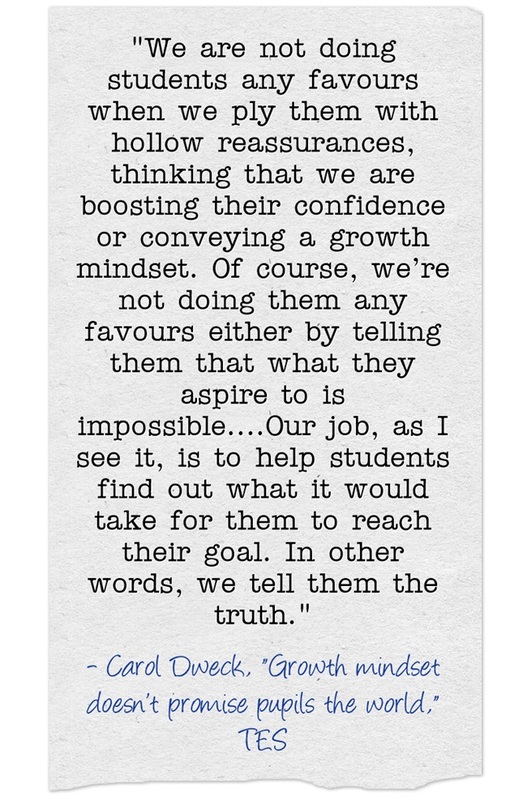 Listen, I don’t think you’ll find many others who admire and apply Professor Dweck’s work more than me (even though I have critiqued it on occasion – see Our Students Are Not Supermen & Superwomen and The Limits To The Power Of A Growth Mindset (& The Dangers When We Don’t Recognize Them). It seems to me that deliberate practice debunkers often raise a red herring saying that advocates say that anybody can become an expert through deliberate practice. What I have read and learned in research on the topic is that deliberate practice is the most important element in developing expertise that is within a person’s control. What do you think? Am I the one misinterpreting Ericsson? Hey, I don’t think she’s criticizing Erricson & his work. She only wanted to make a point that many teachers and educators “in the name of growth mindset” falsely praise children.